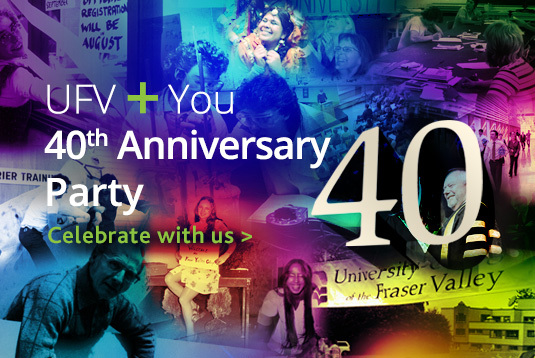 The UFV 40th anniversary celebrations continue Tuesday, Oct 21, in Mission. UFV is partnering with Mission Community Services in offering the annual Celebration of Light (Diwali) – a free public event. Help UFV celebrate by joining in this community event. It includes delicious food, crafts, music, dance, and lively entertainment from diverse cultures. Visit the UFV photo booth. There will be a giant birthday cake! Entertainment begins at 6:30 p.m. with the Korean Drummers and includes performances by the students of Dashmesh Punjabi School, a local dance group and the UFV Bhangra team. This is a free event but donations of non-perishable items for Mission Community Services Food Centre are greatly appreciated. UFV Cascades Athletics busy on all fronts this weekend — catch them at home!